I have two sisters living in the Denver, CO area who grew on the farm. 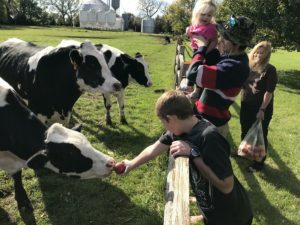 They are striving to keep their kids connected to the farm through visits usually timed around harvest. This year the weather wasn’t very cooperative so the opportunity for a combine ride was nearly non-existent. 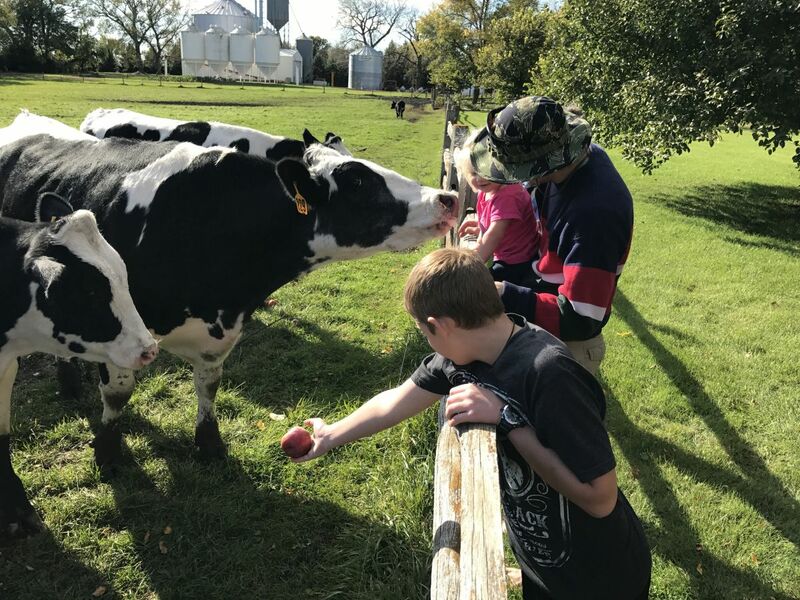 The did have a chance though to tend to the steers needs by feeding them an endless supply of apples harvested from the nearby trees. Where there’s oil leaks, there’s fire! Sunday, October 2 was a day to remember but not in a positive way. We had just started filling our second truck with soybeans when disaster struck. I had unloaded the combine onto the grain cart while heading back to the road. 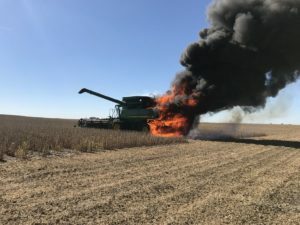 Once I got to the road, I decided to dump off the few bushels I had left in the combine since the auger was passing right over the truck as I turned around. Once unloaded, I headed back into the soybean field. I didn’t get more than 50 feet down the field when the monitor on my armrest had a big red warning about low hydraulic pressure. Thinking I was spewing oil all over the place I shut down the combine and stepped out the door to investigate. As I looked back at the engine compartment from the top platform of the ladder, I saw a large ball of flames in the hydraulic pump area. 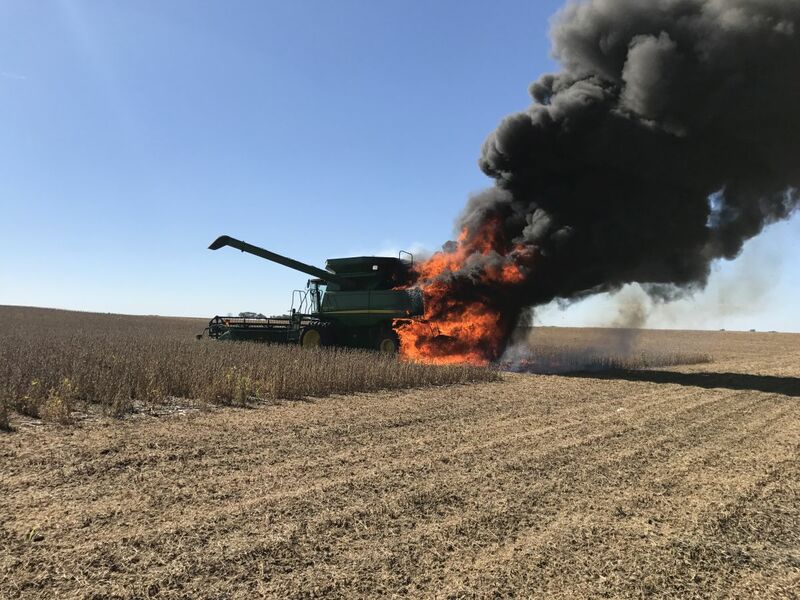 I turned on the radio and told Dennis, who was in the grain cart, to call 911 immediately. He came over, as I was emptying the cab of important items such as my monitor with all the data on it, and emptied the fire extinguisher on the fire to no avail. We did what we could to secure items from the cab and stood back watching the flames grow as we waited for the fire trucks to arrive. 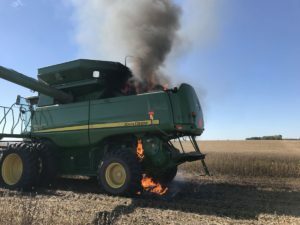 Needless to say, the combine was a total loss but the fire department did manage to save the bean head. 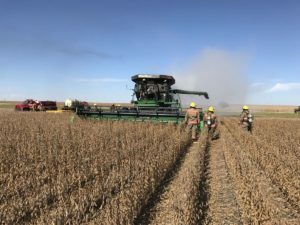 We were able to rent a combine the next day and use that until we made a purchase. We used some down time during rainy days to research and look at combines in the area and settled on a John Deere S660 from Worthington, MN.